Today pupils in school greatly enjoyed a visit from Simon James, a well known children’s author. 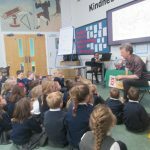 the pupils were amazed at his drawing and storytelling skills. A huge thank you to Mr James for visiting and we will remember this visit for a very long time!